My last couple of airline trips have been to Europe but this month the magic bidding machine gave me a 10-day Pacific trip. 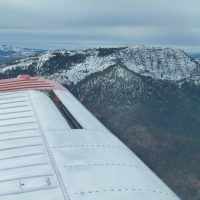 It started out really well – a deadhead (DH) leg to a layover. That rough day was followed by a flight to Honolulu for a 42-hour layover. After that we had to actually start working – well, flying. From Honolulu we flew to Tokyo for a layover and then back to Honolulu. That was followed by a flight to Osaka and back. Yeah, I know, a winter trip with three Honolulu layovers. Somebody had to do it. Our flight to Osaka took us on a southern route to try and avoid the strong jetstream winds that were present in the Pacific this week. 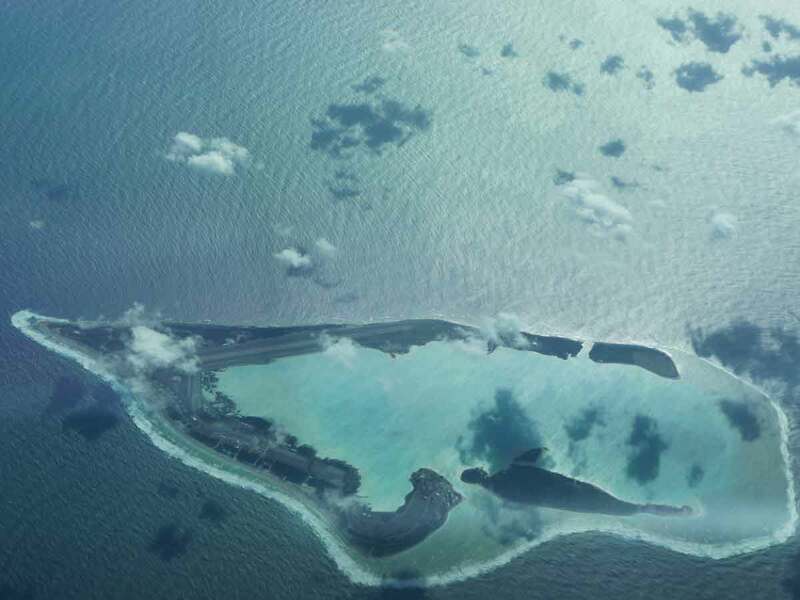 One of our enroute alternates for this flight was Wake Island, an atoll about half way between Honolulu and Guam. Wake has a 9800’ runway and is controlled by the U.S. Air Force but it is available to air carriers as one of the few alternates in a very large ocean. Our route took us almost directly over the “island.” The weather was actually good enough to snap a few shots as we went by at FL380. 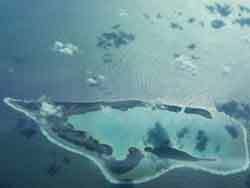 According to Wikipedia the atoll is about 12 nm long. It doesn’t look like a place where I would want to spend much time. We speculated about how long we would be staying there if we actually had to divert to their runway. Those strong winds resulted in a 10:30 flight time to Osaka while the return to Honolulu was completed in 7:50. Here is a photo of our Airbus A-330 cockpit instruments for the return flight. The PFD (Primary Flight Display) on the left shows that we are level at FL390, indicating an airspeed of about 252 knots (mach .814) and flying a heading of about 089 degrees with the altimeter set to STD (29.92 “Hg). 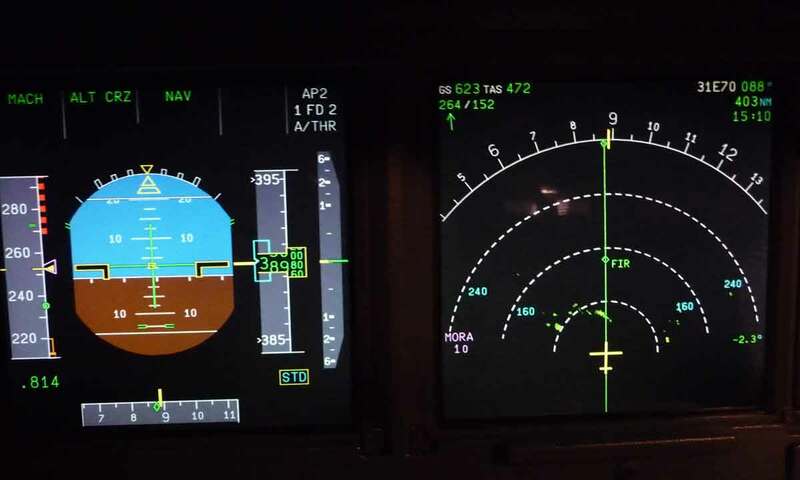 The top lines on the PFD show, left to right, The autothrust system is holding a mach speed, the vertical navigation is in the Altitude Cruise mode and the horizontal mode is Navigating according to the pre-programmed flight plan. Autopilot 2 is in command, both Flight Directors #1 and #2 are operating and Autothrust is engaged. The screen on the right is called the ND (Navigation Display). The green flight plan course line is showing in the center of the screen and a user-generated fix called FIR is about 150 nm in front of the airplane. That is a fix that I programmed into the navigation system at the dividing line between the Flight Information Regions of Tokyo and San Francisco (Officially RJJJ – Fukuoka and KZAK – Oakland). The information in the top right of the screen shows that we are navigating toward waypoint 31E70 (North 31 degrees, East 170 degrees) which is at a heading of 088 degrees and 404 nm from our current position. The Flight Management System estimates we will arrive at that point at 15:10 Zulu Time. The top left corner shows that we have a ground speed of 623 knots and a True Airspeed of 472 knots. The winds at the current position are from 264 degrees at 152 knots and the wind arrow shows that it is almost a direct tailwind. We were flying almost in the core of the jetstream in very smooth air. We had occasional light chop, but it was mainly a very enjoyable ride. I have one more leg left on this trip – back to the winter wonderland. Next month I’m back to flying European trips. It’s a nice change of pace, but I actually prefer the Asian trips. Maybe it has something to do with the warmer weather and more relaxed flying environment. Crazy winds! 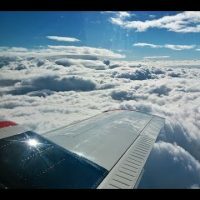 I fly a CRJ200 and one night going from DEN to MEM we were clocking 601 kts ground speed. 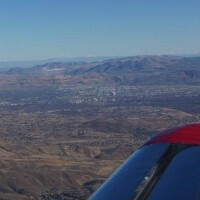 We had 200 kts of direct tailwind. Normally we cover the ground at about 400-425 kts. Luckily it was a clear night so it was really impressive to see the ground slipping underneath us as we flew across the US at 33,000 feet. I mentioned it over the PA what our groundspeed was and the passengers really seem to enjoy it.